I’ve got a special treat for you guys today: data visualisation! That means a lovely infographic on partner visa costs! As you all know, I’m obsessed with how much partner visa costs nowadays, particularly when I’ve watched it increase over the years – sometimes over a few short months! But the question remains, just how much has it increased over the years? And what about the processing times? These questions keep me up at night and I thought, why not finally investigate and track the rise and rise of the Great Australian rip-off? As an immigration lawyer, we’re notified ahead of time if partner visa fees will increase – these are due to legislative changes and we’re clued into them. We’re given the heads up so that we can submit our client applications way before the price hike or we can notify everyone else to hurry up. So I started my research by diving deep into the legislative amendments, regulation changes and policy updates. Being a lawyer, we love these things but I know it’s difficult for people not trained in the law to read and understand legislation and wanted to provide some sources that YOU can check too. Then it occurred to me that the Australian Government (thankfully being a democratic nation held accountable to its people) would have to publish these visa fees in a bid for transparency. And voila, they have visa fees listed all the way back to 2004. 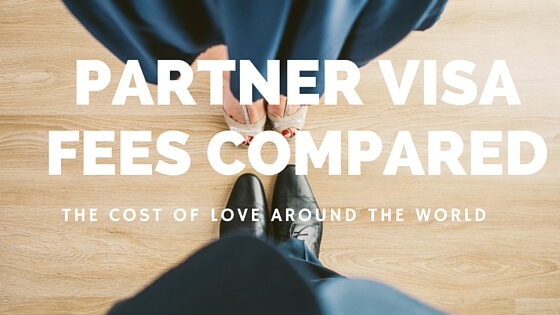 Next I chose countries all around the world where I could compare partner visa costs. A little bit from Europe, a little bit from Asia and a little bit from North America. What I discovered next was shocking, surprising and frightening! It had me saying ‘surely not!’ One guess as to who has the highest partner visa fees…Australia. The UK demands a more reasonable $2,510 AUD for a partner visa application and even New Zealand our closest neighbour asks $1,765 AUD. Countries in Europe take a more rational approach towards loving foreigners and simply ask for a standard fee for all visa applications. Even the US where you hear horror stories about green cards, illegal immigration, building walls along borders; the story is not as dire. And you know how we talked about the Australian Government ripping off its citizens when it comes to bringing partners to live in Australia with them? Well now we have empirical proof. I tracked the partner visa fee increases from 2004 – 2016 and there has been an upward trend in charging more and more each time. Throughout 2004 – 2010 the increases have been incremental and steady – most likely in line with inflation. Then everything heads north at an alarming rate. The increases get bigger and bigger and finally the 2015 push to grab more money occurs. I remember when they announced the January 2015 increase in partner visa fees. It came without much advance warning and implemented almost overnight. It didn’t give many of my clients much of a chance to lodge before then. You will see that there were different prices for offshore and onshore applications and then the sudden jump in 2015 was attributed to ‘harmonising’ the fees and making it more ‘equal’ for everyone. That’s right folks, they basically said: “we’re making it fair by making it just as expensive for everyone, no matter where you are”. And what was their reasoning for this 1.5 times increase in an already expensive category of visa? The official reason was that they were increasing the partner visa fees in line with other countries but as you soon will see, there are no other countries that charge what we charge. Well frankly, it smacks a little of “we need money and our citizens will pay because who doesn’t want to bring their partners home?” – the Australian Government is holding love to ransom! Another pet peeve of mine (and another one that keeps me up at night) is the processing time. I took those same countries and investigated their visa processing times. Most countries allowed you to be with your partner whilst they process your visa and most countries gave you an answer relatively quick. We’re talking some as short as 5 days! Take a guess as to how Australia shaped up. As usual I’ve gathered everything together and put them in a pretty little infographic. The more people know about how high these costs are, the more that they can prepare earlier and not risk losing it all. FREE Video Course Coming Soon! Sign Up For Access.